Traditional Celtic-style music as you've never heard it before. Toe-tapping and irreverent Celtic and Australian tunes with just a few moments of the Celtic soul. 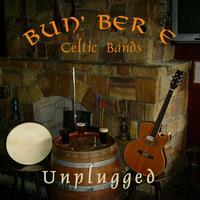 Another collection of toe-tapping Celtic tunes from the boys of Bun' Ber E! This one sounds just like having them standing in your living room. Featuring ten traditional sets and the irreverent original "Heart's with You", Unplugged was recorded "live" in Focksy's studio in October. It's just the three-piece outfit: Hughie on guitar, Mal on flute & whistle and Trevor on percussion (mostly bodhran). After the release of their studio album, Ceilidh, the boys were constantly asked at shows for a recording that "sounds like what I just saw". Their response - ironically six months in the making - is Unplugged. It showcases the boys' raw energy and enthusiasm, highlighting the energy they generate. Along with their own unique take on what traditional Celtic music could be, this time Bun' Ber E have given back to the genre, with Hughie's very cheeky "Heart's With You". Plenty of energy, humor and reaking of good times, with Unplugged Bun' Ber E have done it again. This robust rendition of traditional Irish tunes makes fun listening. Full voices, nice flute work. Another Australian group that I'd recommend is Bloodwood from Alice Springs.